Home > Events > 14 years since I wished to see Dinosaurs!!!! 14 years since I wished to see Dinosaurs!!!! It has been 14 years since I saw Steven Spielberg's Jurassic Park in 1993 and wished if only day I could see the fossils of these creatures. Today I went to downtown Chicago to visit the Field Museum and finally got a glimpse of these magnificent creatures. Really, you got to see them to believe them. 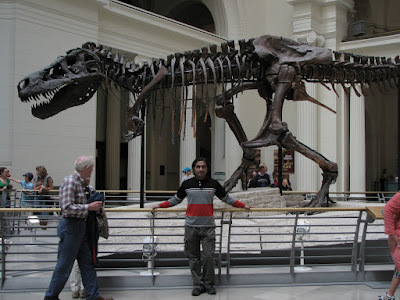 The one behind me is an actual fossil in it complete recreation. The first thought that crept in my mind when I first saw it was, we couldn't have had any chance in front of these mighty creatures if they would not have been wiped off the face of the earth. We still would have been leaving in caves(if we managed to evolve in their presence) just trying to survive by hiding us from them. Too bad the authorities didn't allow me to take any snaps of the other fossils!!! !